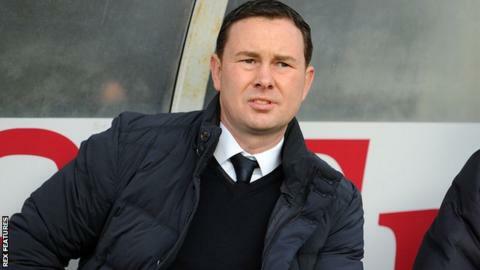 Plymouth Argyle manager Derek Adams has criticised Wycombe boss Gareth Ainsworth for refusing to shake hands at the end of their ill-tempered League Two game at Home Park. Wycombe beat the Pilgrims 1-0 and there was a scuffle between players for both sides after the final whistle. "I'm disappointed in Gareth Ainsworth not to shake hands after the game," Adams told BBC Radio Devon. "You should always shake hands with your opponents, but he chose not to." The match was the first time this season that Plymouth have not scored in a home league game, and although Adams did not see the post-match incident, as he was already walking down the tunnel, he was critical of the way Wycombe set out to play the game. "They wasted time; we had nine minutes of injury time in the first half and we had a good number in the second half. "They did frustrate us, they did foul a lot, they did go down injured, but that's the nature of the way they play and something that they see as being successful. "One of their players went down with a head knock and then it was his leg that he was getting treatment on," added Adams. "I can see that, everyone else in the stands can see that, that's not what people come to pay their money for, it's not something that's good for the game and I'm disappointed that the game happened in that fashion. "It's something that English football doesn't want to see, fans and spectators of Plymouth Argyle don't want to see, players going down with a head injury when they don't have a head injury and I think that's a bit disrespectful."